We’re very excited about the hyperbaric oxygen chamber that will be arriving soon. Hyperbaric therapy has been proven in people for many years and now our furry friends will get to benefit too. 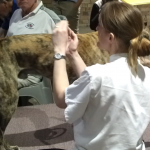 The brand we have chosen is particularly safe and people can sit in the chamber with their pet if they like. Hyperbaric oxygen therapy (or HBOT as it’s called in the trade) was originally used for deep sea divers with the bends. These days, portable units are available. HBOT works by driving oxygen deeper into the tissues than normal room air does. A better oxygen supply improves healing from injuries and recovery from sport. There’s a lot of research showing that it’s beneficial for people with brain injuries, muscle tears and injuries to other regions of the body that normally don’t have much blood flow. Underwater treadmills the pinnacle of hydrotherapy for many years, but they have also been ludicrously expensive! We’re now anticipating the arrival of our very own underwater treadmill which has a number of world-leading features. Our treadmill will put safety first with top quality chlorination and filtration systems. The manufacturer, aquatread is even customising it for us to include attachment points for resistance band exercises. 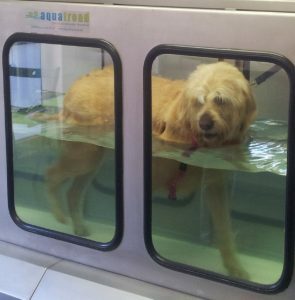 When it arrives, our underwater treadmill will have your pet’s safety and comfort as a first priority. There are two doors and two ramps to ensure your pet can walk forwards in and out. There are also emergency stop buttons should your pet have any difficulties during hydrotherapy. New Workshops are Finally Here!